Q: What is the thinking behind the summit? 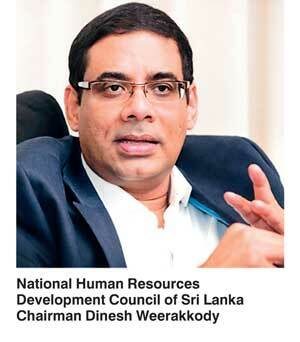 A: The Human Capital Summit is organised by the Government run National Human Resource Development Council (NHRD) and the Association of Human Resource Professionals of Sri Lanka, to deliberate on human capital challenges and opportunities with a view to develop a national agenda to support Sri Lanka’s growth goals and sectoral goals. The organisers wanted to bring together some of the best education and HR experts in the WB, ADB and ILO along with business leaders in the region to share insights on the way forward on some of the critical skills challenges that we face currently and may emerge due to changing business dynamics in the Sri Lankan market and oversees. As you know most employers are saying the skills shortage is a major constraint for expansion; and continue to question the quality and relevance of general education, vocational and skills training and higher education. This needs to change if we are to realise our full potential as a country. Q: The theme of the conference is towards a future ready workforce. What do you mean by a future ready work force? A: Simply put, it is anticipating and building competencies for future needs, to realise this goal in addition to the resources, we need to have a sustained dialogue between employers and trainers, coordination across government institutions, proper labour market information and good employment services. Q: Specifically are you addressing the people challenges in any sectors? A: Yes, we are addressing some of the HR related challenges affecting sectors like tourism and hospitality, services-financial, insurance, back office and transport and ports, construction and manufacturing and foreign employment. We believe these sectors can deliver the million jobs the Government is working to deliver by 2020, provided the skills gaps are addressed and the right investments are done. As you know, today out of most of our young people coming out of secondary education: Only 20%-25% attend higher education, of which a large share of students are in humanities and arts relative to sciences/engineering (50% vs. 17%); where there is variation in quality, in addition, very poor quality External Degree Programs (40% of total enrolment, another 20%-30% enrol in Technical and Vocational Education and Training (TVET) sector; very often the courses are of poor quality and have little relevance to market needs; the remaining 45%, have limited opportunity to acquire further job-specific skills other than joining a company to develop skills. That too is limited and is centred around three to four main cities. The majority of young people join the workforce with no skills. As I said before the Government, industry, trade union and academia must work together to address this challenge. A: Labour migration from Sri Lanka has been increasing over the past three decades. Close to 27000 persons went overseas for foreign employment in 2015. Interestingly, the skilled labour category contributed to only 30% of total departures. Therefore, it is imperative to diversify and focus on new markets and conduct research to identify labour market needs, understand skills gaps and develop strategies to meet the needs of the new labour markets. We need to move up our skill levels like what is now taking place in the Philippines. Q: What do you hope to achieve from this summit? A: The outcome envisaged is a National Human Capital Agenda with strategies and action plans. We wanted to bring together thought leaders and think tanks, both local and international to set the tone, dialogue and also to form sectoral working groups. These groups have a mandate to recommend solutions and work around identified gaps in growth sectors, to suggest national level policy reforms and programs which would be presented to the Government. The Summit will be a platform for a high-level focus group discussion to arrive at need identification and developmental priorities that will eventually result in the engagement of all stakeholders. It will also facilitate a discussion to find solutions to bridge the skill gaps to build a future ready and globally competitive workforce. This summit will also provide an opportunity to discuss strategies to promote increased participation of women in the economic growth giving a better return on investment to the Government on the country’s free education system. The Summit will explore strategic entry points to embark on labour law reforms necessary to improve our Labour Market Efficiency. Q: Why do you say Sri Lanka needs a national agenda and strategy for labour? Don’t we have one? A: Recently at a public forum a speaker noted that Sri Lanka very badly needs a national vision for labour, backed by funding, realistic targets, an implementation strategy and all the Government agencies working together. Also far greater private sector participation to address the education and skills gaps in the country. Currently the speaker said each group is working in isolation. We all know that adequate education and skills can improve the employability of workers and the productivity of enterprises. This realisation has led to increased interest in employers of skills to actively participate in the formulation of skills development policies. Many of these policies, increasingly broad in scope and outreach, are underpinned by efforts to bring the world of education and training and the world of work closer together. Q: What is creating this urgency? A: Many policy-makers are aware that if we are to gain or maintain our status as a middle-income country, we must produce the higher value-added, higher quality goods and services that can yield higher wages and profits. To do this we need a skilled workforce and to get there, we need an education and training system that adequately prepares young people to enter the labour market. This argument runs alongside current thinking that economic development must not only look for rapid economic development, but also inclusive growth. The policy that grows out of this is the increased interest in skills development as an important means of addressing economic, social and developmental concerns. It focuses not only on young people who have completed their formal schooling but also on adult workers, school drop-outs, workers in the informal economy and disadvantage groups. Q: What are the skills challenges that we now faced with? A: Firstly, the skills mismatch. Skills obtained through training and those required by the job often do not match, resulting in skills shortages in some areas and simultaneously a surplus of workers with skills that are not in demand, contributing to unemployment and underemployment . Secondly, the limited involvement of all the key partners; in Sri Lanka we lack the active participation and coordination between the state, employers and worker organisations that is very essential to ensure the provision of relevant and appropriate training. Thirdly poor quality and relevance of training; weak quality assurance, too few or poorly paid trainers, poor working conditions for trainers, and outdated skills, curricula, training materials and methods, all inhibit the quality of training. Limited labour market information and inability to translate such information into improved training interventions undermines relevance. Q: What can be achieved by developing a National Skills policy? A: The arguments for formulating a national skills development policy, as opposed to merely improving skills development, would be that a national policy presents a common vision of the skills system that the country is aiming to build and therefore conducive to a more holistic response to human resources planning that draws together the various government agencies, employer organisations and providers of education and training. A national policy would also enable reforms to be achieved with clear statements of responsibility shared among Government, educators, the social partners and the private sector. In the past few years the country has made great strides on many fronts, especially in education and skills training. A lot more however needs to happen. If progress is to be made there is definitely a need for greater coordination between the various relevant ministries and institutions providing TVET and higher education. The current disjointed system is only leading to a misallocation of our tax-payers money. Therefore we urgently need a mechanism to ensure there is better private sector participation in designing and updating of standards, course contents, training of instructors, funds are allocated based on performance and finally strong political leadership to ensure that all government agencies in the TVET and higher education sectors work together to deliver the skills the employers of human capital needs. (The writer is a graduate in business administration and works for a research company).